Here is a list of my current books. Covers will be coming as soon as I am ready to put these up for sale. 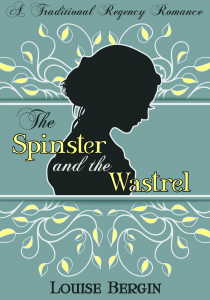 The Spinster and the Wastrel (Traditional Regency) – She inherits his money! Can he get the fortune back from the reform-minded spinster? Golden Heart® finalist, Royal Ascot winner, RT Top Pick! A Worthy Opponent (Traditional Regency) – A fortune hunter goes after the wrong target. He’s determined to stop her. The Winter Duke (Traditional Regency) – The man she met in the woods is not who she thought he was. Playing for Keeps (Contemporary Romance) – A widow seeks a positive male role model for her trouble-making son, but the coach is more than she expected!